“We (the industry) are always looking for a single answer. That's a very dangerous way of thinking. 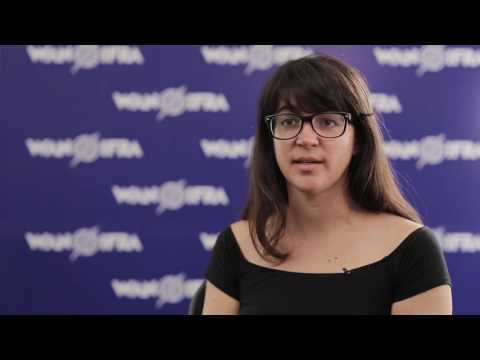 You have to be constantly diversifying everything,” Melissa Bell, Vice President Growth & Analytics, Vox Media, told WAN-IFRA's Dean Roper during an on-stage chat in Cartagena during the World News Media Congress. The Vox site was started two years ago with the aim of doing a better job of explaining the news to people. One way it does that is via its well-known “card stacks,” which allow readers to delve deeper into a topic. Bell said the site has grown very quickly and today has a 70-person newsroom. The larger company, Vox Media, was founded in 2003 and today includes eight brands, such as SB Nation, The Verge, Eater and Re/code. Bell said SB Nation, a sports website, which includes some 300 blogs, has 1,600 people contributing to it, The Verge and Vox are about the same size, and the others are smaller. Noting that today, "There's so much demand for quality content out there," she said she sees Vox's competition as very broad – and would include TV shows as well as traditional media, such as The Washington Post, where both she and Vox founder Ezra Klein used to work. Bell also said the company uses a lot of shared assets (such as sales teams) to support the various brands. In addition to the advantages of these shared assets, the larger network of different brands allows Vox Media to test things with individual sites, she said. “The challenge now, and also the opportunity, is in creating stories. We create small teams and encourage them to go off and experiment. We believe in having a very tight connection between the brand/product and the storytellers, and these teams work very closely together,” she said. Vox Media is also diversified in its revenue streams, which include an events business that organizes conferences, etc. Later asked by an audience member whether she considers Facebook and Google to be partners or competitors, Bell said she would like to think of them as partners. Bell said Vox's global presence has expanded as it has it has an office in London, and also has activities in China. But she said Vox has to be careful not to merely replicate a certain "model" for specific regions or markets.